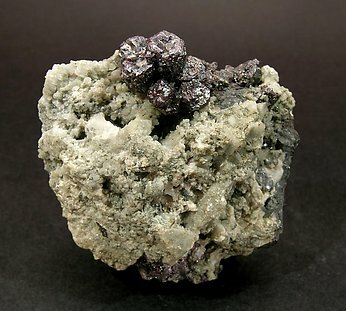 Aggregate of crystals, on a little matrix, with a prismatic shape and flat terminations that are very bright, translucent and have reddish reflections. 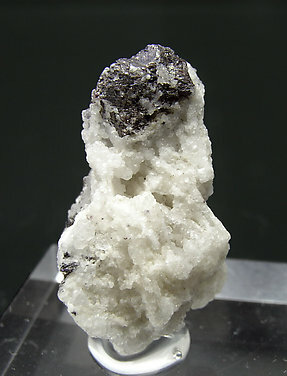 It is from a locality that is very new in the mineral world and that is producing very good silver sulphosalts. The sample has been analyzed and we’ll send a copy of the analysis to the buyer. 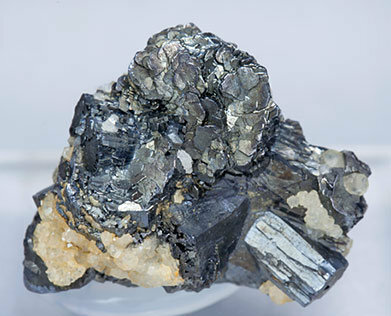 Group of Pyrargyrite crystals with parallel growths, one of them clearly dominant, with very well defined faces and edges and with good terminal faces. They are translucent, extraordinarily bright, with vivid red reflections and are on a Quartz matrix. 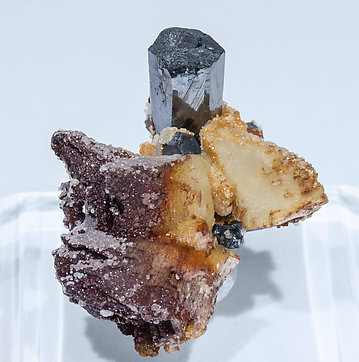 A single crystal with relatively complex crystalline forms. 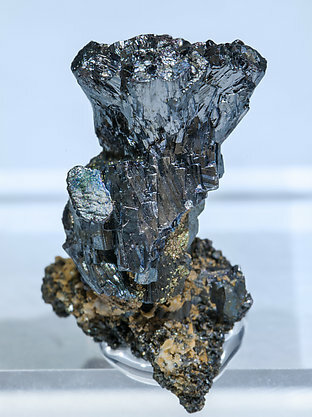 It is very bright and with good info about its origin: is from the "Beschert Glück Mine" a well known mine in the Freiberg District. A German classic. An excellent classic in “thumbnail” version. Crystals have very well developed and defined faces and edges. A group of crystals that combine the forms of a well-defined, brilliant ditetragonal prism with those of the rhombohedron whose faces have grown in a curved form, which makes them look rounded. It is a floater. It comes from the David Lucas collection, number 807, and we will give the buyer the original label. 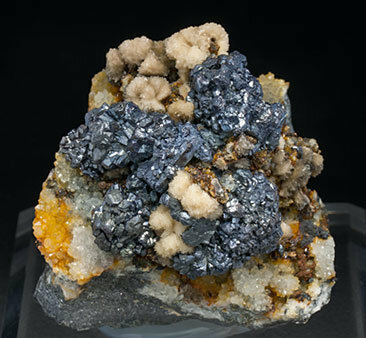 The crystals have a good size and are better defined than usual in the famous and very desired specimens from the Hiendelaencina mines. The top faces clearly show trigonal geometry. The group is a floater. We can consider it a classic among classics. 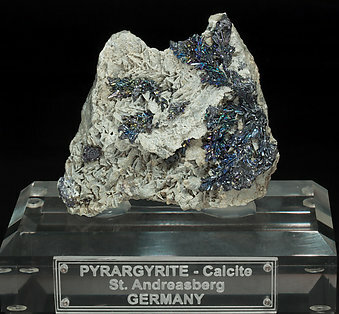 Effectively, Pyrargyrite one of the species of reference for old German localities and especially for St. Andreasberg. The group is formed for relatively short crystals with excellent terminations formed by three faces of the rhombohedron. Color and luster, especially if we consider the antiquity of the sample, are very good. Well developed small crystal group with little recrystallizations on the face’s surface. On a white Quartz matrix. 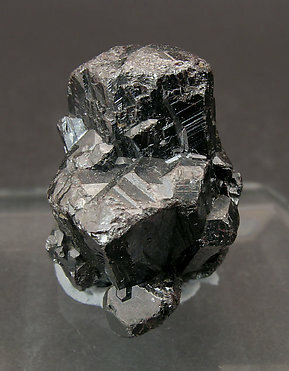 Aerial Pyrargyrite crystal with very well defined faces and edges and excellent terminal forms. 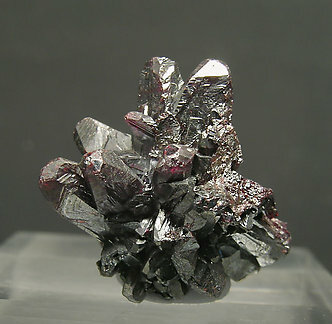 It is translucent with vivid red reflections and implanted on a matrix of scalenohedral Calcite crystals. 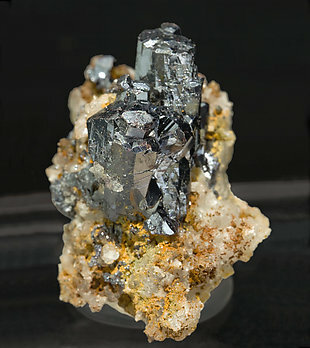 Crystals of Pyrargyrite in a vein filled by acute scalenohedral crystals of Calcite on a matrix of massive Pyrargyrite. A classic of Czech mineralogy. 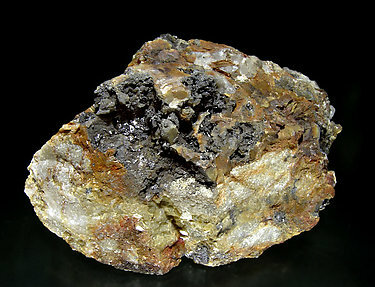 Aggregates, one of them clearly dominant, on a Calcite matrix of very acute Pyrargyrite crystals, translucent, bright and most of them doubly terminated. An “oldie” from a locality considered as especially classic for the species. 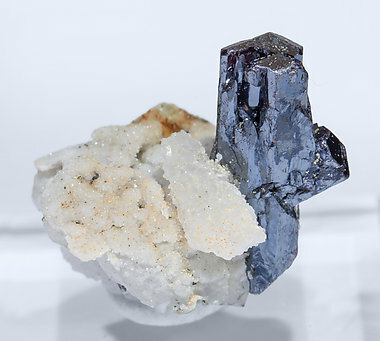 A beautiful group of prismatic crystals on the typical Calcite matrix from St. Andreasberg. in spite of its antiquity (it was purchased by Folch in 1955 but surely is much older) it is perfectly preserved and the crystal surface has reddish reflections not always present in the species. 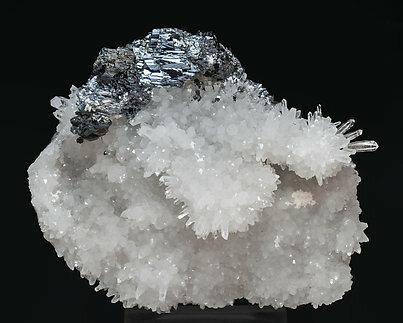 Sharp arborescent growths of Pyrargyrite crystals on Calcite matrix. They have very well defined faces and edges, very good terminations and show a fine iridescent patina. Excellent German classic, very esthetic and unusual. 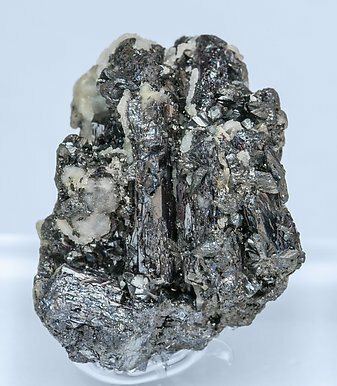 Rounded aggregates of short prismatic Pyrargyrite crystals with very well defined faces and edges and some of them are doubly terminated. 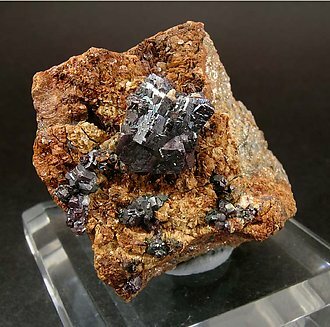 They are reddish and are on a matrix with spheroidal aggregates of small scalenohedral Calcite and Quartz crystals. A Mexican classic. Excellent miniature. 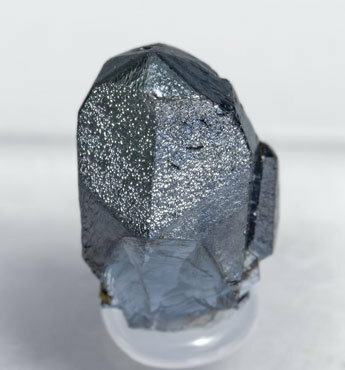 The Pyrargyrite crystals are elongated, have very well defined faces and edges, have perfect terminations, and are exceptionally bright, being on a Quartz matrix with Calcite. 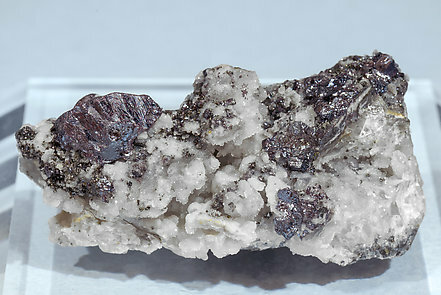 Group of very well defined and bright Pyrargyrite crystals partially coated by white Quartz and small but very well defined Miargyrite crystals. The Miargyrite has been analyzed. An excellent miniature. We will send a copy of the analysis to the buyer. 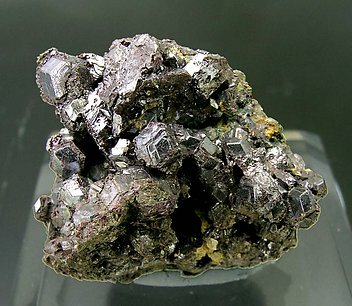 Group of very bright Pyrargyrite crystals with very well defined faces and edges, with an associated group of very sharp small Polybasite crystals and on a matrix of Quartz crystals. 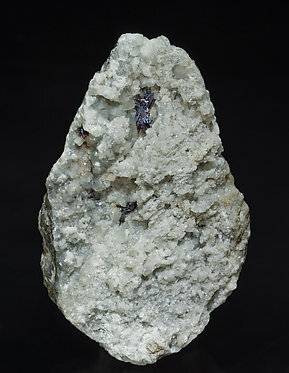 Aggregate of prismatic crystals with a very well defined hexagonal shapes, excellent terminations, very neat and bright, and partially coated by small Quartz crystals. A little Mexican jewel. A novelty at Tucson 2018. 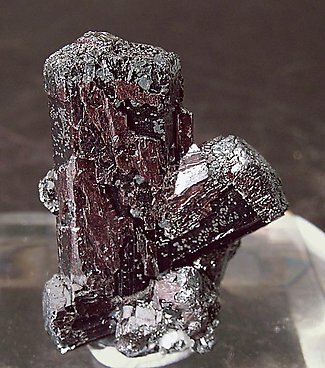 Single translucent Pyrargyrite crystal with parallel growths, fine striations and intense reddish reflections. On matrix with small white Quartz crystals. The sample has been analyzed and we’ll send a copy of its analysis to the buyer. The crystals are excellent, with prism faces less long than is usual for the species. It has a perfect hexagonal profile, with top faces totally flat and very esthetically positioned on its Siderite matrix. The specimen is with a very old label written with an old pen which is the base for autographed notes from Sr. Folch. 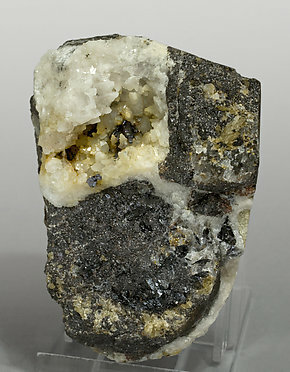 Small crystals of faces better defined than usual, on a matrix of Siderite and Quartz. This classic, classic, specimen has been chemically analyzed and we’ll send a copy of the analysis to the buyer of the specimen.